That gorgeous lady on the left is Barbara Jo Kirshbaum. I met Barbara Jo years ago while walking one of my Susan G. Komen 3-Day for the Cures, 60 mile walks that take place around the country raising money and awareness for the battle against breast cancer. Barbara Jo is a marvel. 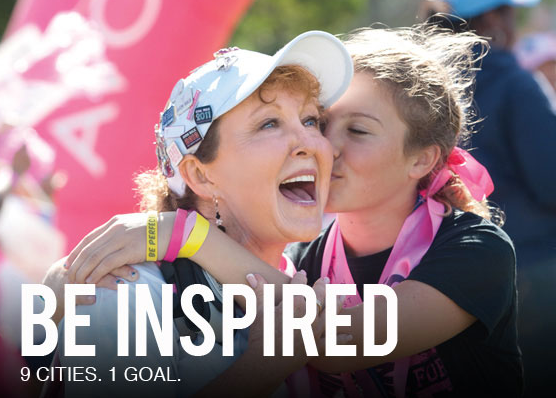 She started walking in 1998, and since then has raised OVER A MILLION DOLLARS For the Avon and Komen organizations. As Team California, Barbara Jo and her late husband, Dr. Bob, could be seen at several events yearly. Their bright pink signs toting slogans such as “You’re Beautiful” and “Just Keep Walking” dotted the miles. Dr. Bob would be standing on street corners next to their rented car throughout the entire weekend, smiling, clapping and giving hugs as needed. Barbara Jo would be walking away, a cape of ribbons imprinted with the names of those she was walking for on her back. I’ve seen her over the years in many walks, and she’s been such an inspiration and source of support as I’ve dealt with my on and off health and my changing ability to complete my goal of walking every city the Komen organization organizes. On my Twin Cities walk this year, I found out that Dr. Bob passed away last year. My heart broke a little bit when I heard the news, as I’d been walking for miles in excitement to see him and Barbara Jo, their coming foretold by those Team California signs. The Komen and Avon walkers lost a foot soldier in our fight to make sure that breast cancer is no longer a life threatening illness, and I thank Dr. Bob and Barbara Jo with all my heart for their work over the years, and for Barbara Jo continuing to walk after Bob’s passing. I did a little tribute to Bob in my Frosting for the Cause post, and was grateful for a way to mark his passing in words and by making something sweet for others. This weekend the Avon Walk for Breast Cancer comes to NYC, as does Barbara Jo, now with her son-in-law Chris putting up those bright pink signs. I’m excited to be out there first thing tomorrow morning, about 40 blocks from my apartment, cheering along the walkers on the first few miles of their journey. Later in the day my sister and I will join them with more cheering and homemade trail mix cookies – part of my promise in making a cookie for every $10 donated to my own walk this year (this will bring my total to about 140 out of 400… still a long way to go!). 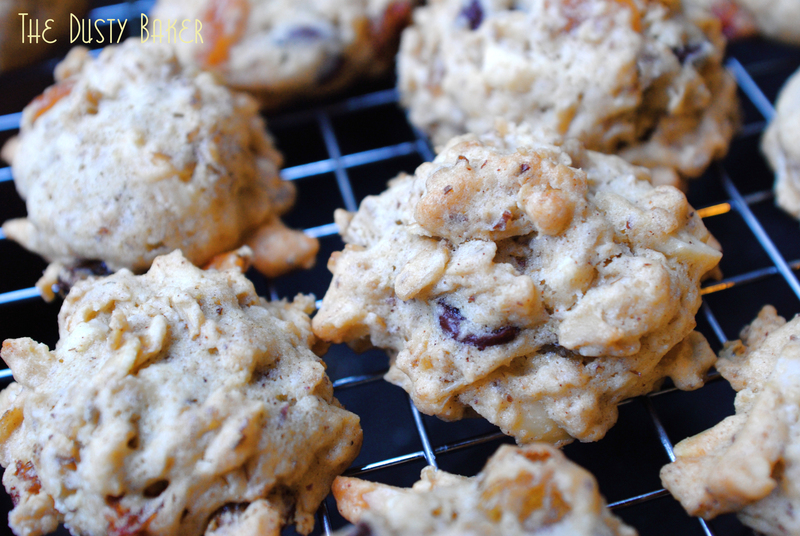 So these cookies are what I made for the walkers: a not-too-sweet trail mix cookie that’s gluten and dairy free, and packed with extra fiber and protein. Such cookies are endlessly versatile – alter the amount of chocolate, nuts and fruit as you see fit, or the kind of additions you want to begin with. 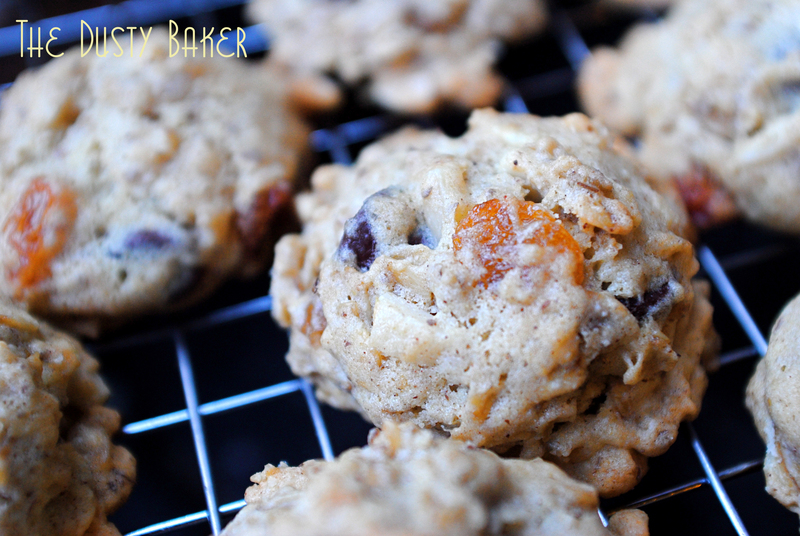 The base cookie is soft and sweet, undetectably gluten-free, and ready for a bit of dusty fun. Thank you so much to all the women and men walking, crewing and staffing the Avon walk this weekend. These events are incredibly eye-opening for those who see thousands walking in pink, exhausting themselves and committing to raise a large amount of money for a necessary cause. Can’t wait to get out there and tell you how truly amazing you are. Line 4 baking sheets with parchment paper or Silpats (totally worth the $). In a medium bowl, whisk all dry ingredients. In the bowl of a standing mixer (or in a large bowl) beat Earth Balance on high heat until fluffy. Add beet sugar and cream until the mixture lifts and gets pale. Add eggs and beat until fluffy, about 2 minutes (beating the eggs gives a little lift and body to the coming flours). Fold in the chocolate chips, raisins and nuts. Put in upper and lower third of oven and bake for 9 minutes. Rotate the trays (switch upper and lower) to ensure even baking and bake for 9-11 more minutes, or until lightly browned at edges.